From creating a budget to following it, curtailing expenses, or just getting clear a picture of your financial position, managing personal goals is a priority for most of us. In nutshell, whatever is your approach towards personal finance, it’s majorly reliant on having a clear idea of your savings, the source of savings, and the place where it goes. Fortunately, there are tools these days that can help you organize your finances in the best possible manner. GnuCash is one such free finance and accounting tool for personal and small businesses that help them manage big transactions. This tool is compatible with all major platforms such as Windows, Mac OS X and Linux. While you can maintain your records for daily transactions using this open source software, you can also take advantage of its flexibility and strength by tracking your bank accounts, stocks, earnings and expenditures. While GnuCash has its own set of advantages with features like double cash register, tracking transactions, etc. it has some equally good alternatives that are worth a try. It’s a compact and lightweight finance management tool that comes with charting and reporting options. Best of all, it works with all major platforms. While Linux users can get a packaged version in their regular archives, Windows users can also install it by direct download. It’s an easy to use tool that’s perfect for beginners with no experience in using similar software. It offers similar features like other tools, for instance, detecting duplicate transaction, split transactions, import from Microsoft Money, Quicken, etc. and so on. Best of all, HomeBank offers translation in over 56 languages. Supported Platforms – Mac, Linux, and Windows. KMyMoney promotes three primary objectives and those are accuracy, user-friendliness, and simple features. This is to ensure that you start using it and continue with the usage, while you take advantage of the transition. It comes with a package of features that includes QIF import, multiple currencies, investment tracking, account management, forecasting, tagging, and more. Although you may not find the small business features in it like the GnuCash, it can be easier for those who do not want to confused with too many options. It’s a free and an open source tool under the GL version 2. Supported Platform – Linux, Windows, and Mac OS. What we like about Grisbi is its interface which is easy to use and understand, intuitive and clean. Euros is the default currency used in Grisbi, which can be easily changed to any other currency. When supplied with the exchange rate, it can also modify the currency to the actual value automatically. However, the power to generate reports and presenting the data in several ways is one of best things about this software. Export your report in CSV or HTML format or get a copy of it and export the reports to another machine, it allows you all that. Available in 24 languages that supports multiple currencies, Money Manager Ex is a free and open source alternative to GnuCash. While it works on all major platforms, it’s also compatible with mobile phone platform and comes in form of an app. You can track your finances across all devices using the cloud synchronization option. You can also run it directly using an USB key instead of installing the software on your workstation. For enhanced security, your financial information is saved in an SQLite Database (non-proprietary) locked with AES encryption. Tracking credit cards, stock accounts, savings or fixed assets, generating financial reports, or importing and exporting data in QIF and CSV format are some of the many features that it comes with. Supported Platforms – Windows, Linux, and MacOS. 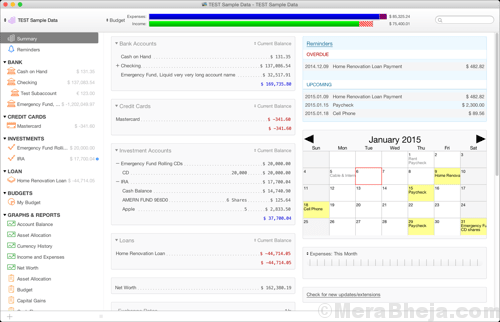 This personal finance management tool is especially designed for Mac OS X. However, it’s also available for some other platforms. 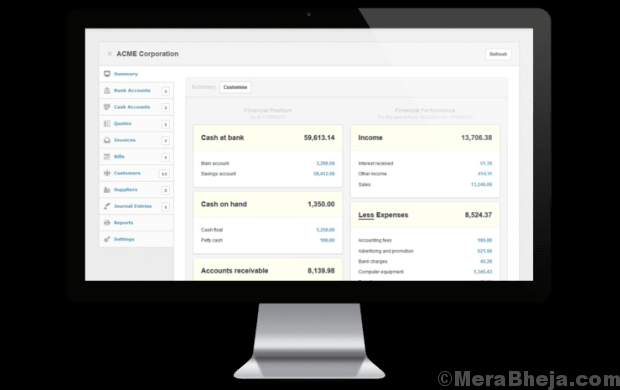 With this tool, you can manage the important accounts easily and efficiently. If you have multiple accounts, then this tool is perfect for you. 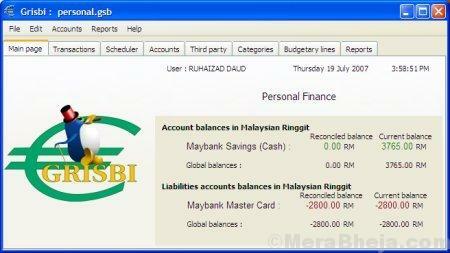 It comes with an easy to use interface that makes financial management a breeze. 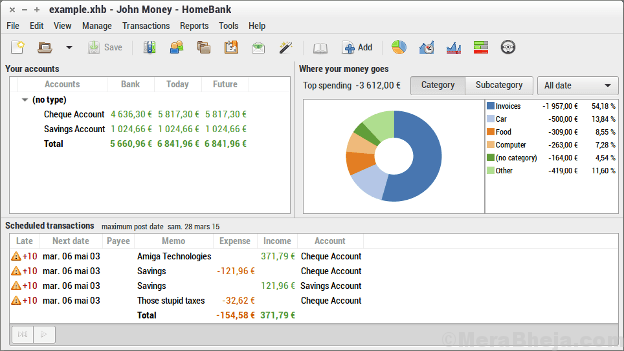 Online banking, summary of your finances, generating visual reports of your income and expenses, keeping accounts register, and reminders are some of the features offered by Moneydance. Comes with a free trial period and 90 days money back guarantee. It’s a Java based software which means this can be used on any platform till the time you can install java and run it on that platform. While you may get a little perplexed with the blank screen on starting this app, with very little information on how to go about it, but if you explore the platform, you will find many interesting features. Supported Platforms – All platforms running Java. It claims to be a free forever accounting software that works on all major platforms and offline too. Its designed only for small businesses and assists them to carry out functions like general ledger, fixed asset management, bank reconciliation, accounts payable/receivable, cash management and much more. With support for multiple languages that can adapt to any country and frequent new updated releases, Manager is a perfect free alternative to GnuCash. Supported Platforms – Windows, Mac OS, and Linux. Spreadsheets is another great alternative to GnuCash that’s perfect for managing your financial data for free. What we like about this dedicated budgeting tools is that, it does not involve any complex formulas. It offers a peace of mind with the fact that there are any other who are using this tool so, you have got help with this when needed. Moreover, it does not store your personal data such as, account numbers in plain text especially, if you save data to a shared space. Supported Platforms – Windows, Mac OS, Linux, Android and iOS. Free for 34 days, this accounting tool is just the right solution for your personal management requirements. No more worrying about missing your budget or maintaining it when you have You Need A Budget. From maintaining your budget aspects like income and expenses to clearing your debts or saving more money, it’s a handy tool that assists you in just four simple steps. The mobile apps are now free as well as for college students. Supported Platforms – Windows, Mac OS, Android, and iOS. If you have multiple accounts and feel difficult to manage, Ledgerist can be a handy tool for you. This way, it helps you keep a check on your savings account, credit cards, and any other accounts, all at the same time. Bonus – it also sorts and arranges your transactions by assigning them specific names and by adding notes. This can be further used to know where and what amount of your funds are being spent. It’s an intuitive software that’s also user-friendly and comes with an easy to understand interface with some power-packed features. From repeat transactions, backup and restore, or choosing from multiple currencies to smart transactions or securing your data with a strong password, it offers a comprehensive solution for free. It’s a free personal finance software that offers a user-friendly experience without compromising on the useful budget tools and the financial reports. If you are among those who do not want to get into the complication of account numbers and passwords to download transactions automatically, this tool is for them. You can simply download the transactions from your bank website and import them, or input the details using the keyboard. You can even choose to make your saving goals public to raise funds or offering family and friends an opportunity to add funds to help your reach your goals. InvoicePlane is a self-hosted software, that’s available to download for free. This helps manage your quotes, invoices, clients and payments effortlessly. You can also customize your invoices using the several options, templates, and settings. It also offers you an option to set up 25 different payment providers allowing the customers to pay the invoices using online payment providers like PayPal, Stripe, etc. It’s a free app available online to help you view your financial transactions and forthcoming bills due on a calendar that’s aesthetically color-coded. This online app not only allows you to create a sound budget, but also helps project your future finances. From calendared reminders or knowing your income, expenses and day-to-day spending to viewing your account balance or planning for projected major expenses in advance, there’s a lot more that it offers. Supported Platforms – Linux, Solaris, Mac OS, and BSD. Prism allows you to track your money and to pay your bills from anywhere, anytime. The best part is, that this app is completely free. The biller is paid directly with a single swipe of your fingers and so, there’s no need to log into separate websites. There are absolutely no hassles and no delays. It also keeps you updated on finding a new bill, automatically. You can also use this app to check your account balances for savings accounts, credit cards, store cards, etc. Bonus – a simple, responsive, and easy to use interface that’s looks equally good at the first glance. Buddi is a compact tool that helps users manage their personal finances though quite effectively. It’s biggest USP lies in the fact that it offers enhanced safety option for its users by encrypting the financial data with a passcode. Moreover, it’s extremely easy to use and is perfect even for the beginners who have no previous experience in finance. Tracking budgets, budget creation, or checking personal finance reports are among some of its features. Although, you will have to input the transactions manually, the ability to download free plugins and added features makes this free tool even more impressive. 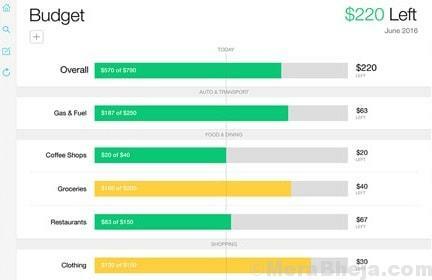 Among the free online tools for budgeting and managing finance, Buxfer certainly has a strong presence. While you can analyse your shared expenses, debts, and split bills using this app, you can also keep a track of all your accounts at one, single place. Not just that, you can also download this app on your iPhone for free and get going with the numbers just anywhere, and at any given time. It syncs seamlessly with over 10,000 banks worldwide without saving your online banking password for safety, allows you to upload bank statements from MS Money, Quicken, and other financial tools, and allows to enter transactions manually while on the go. So, when looking for a GnuCash alternative, explore your options from the above list and get going with your budgeting and saving goals with these fabulous set of finance software.